New York Times bestselling author Dan Lyons exposes how the "new oligarchs" of Silicon Valley have turned technology into a tool for oppressing workers in this "passionate" (Kirkus) and "darkly funny" (Publishers Weekly) examination of workplace culture. At a time of soaring corporate profits and plenty of HR lip service about "wellness," millions of workers--in virtually every industry--are deeply unhappy. Why did work become so miserable? Who is responsible? And does any company have a model for doing it right? For two years, Lyons ventured in search of answers. From the innovation-crazed headquarters of the Ford Motor Company in Detroit, to a cult-like "Holocracy" workshop in San Francisco, and to corporate trainers who specialize in ... Legos, Lyons immersed himself in the often half-baked and frequently lucrative world of what passes for management science today. He shows how new tools, workplace practices, and business models championed by tech's empathy-impaired power brokers have shattered the social contract that once existed between companies and their employees. These dystopian beliefs--often masked by pithy slogans like "We're a Team, Not a Family"--have dire consequences: millions of workers who are subject to constant change, dehumanizing technologies--even health risks. A few companies, however, get it right. 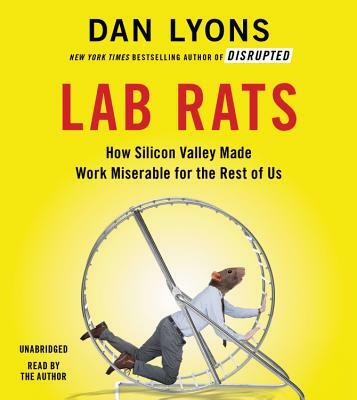 With Lab Rats, Lyons makes a passionate plea for business leaders to understand this dangerous transformation, showing how profit and happy employees can indeed coexist. Dan Lyons is the New York Times bestselling author of Disrupted. He is also a novelist, journalist, screenwriter, and public speaker. He was a staff writer on the first two seasons of the Emmy-winning HBO series Silicon Valley. Previously, Lyons was technology editor at Newsweek and the creator of the groundbreaking viral blog "The Secret Diary of Steve Jobs" (AKA "Fake Steve Jobs"). Lyons has written for the New York Times Magazine, GQ, Vanity Fair, and Wired. He lives in Winchester, MA. "A lively and spirited takedown."